We are hoping to inspire different Thanksgiving side dishes for you this year that are tasty and ultra complimentary to Turkey Dishes. We will be posting several more leading up to the great sharing Holiday. Enjoy each one and see if you’d like to serve one of our dishes as part of you interesting Thanksgiving Menu this year. We try to mix ours up each year. Suggestions for alternative dishes are always welcome. Cook bacon over medium-high heat in a cast iron pan for about 5 minutes or until fat is well rendered. Add Butternut Squash along with Thyme and spices, cook with bacon until Squash begins to brown. Stir often to avoid burning, continue for about 10-15 minutes. 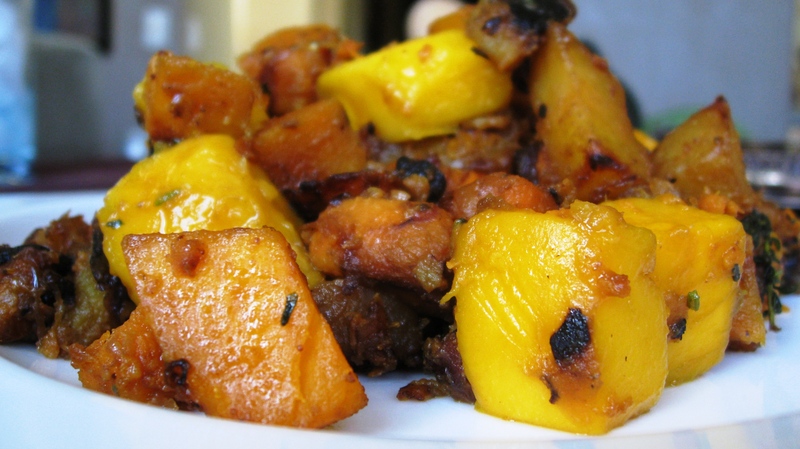 Add Mango and cook for another 5 minutes more, and serve with your favorite pork, chicken or duck dish. …really anything you like.